LONDON--(BUSINESS WIRE)--Technavio has announced their latest drug pipeline analysis report on hemochromatosis. The report includes a detailed analysis of the pipeline molecules under investigation within the defined data collection period to treat hemochromatosis. This report by Technavio presents a detailed analysis of the market, including regulatory framework, drug development strategies, recruitment strategies, and key companies that are expected to play an essential role in the growth of the market in the future. Hemochromatosis is a disorder in which the body simply loads too much iron from the diet. It occurs either by mutations in the gene or by other medical conditions such as anemia, chronic liver disease, and kidney dialysis. Various symptoms of the disease include abdominal pain, fatigue, joint pain, liver failure, and weakness. 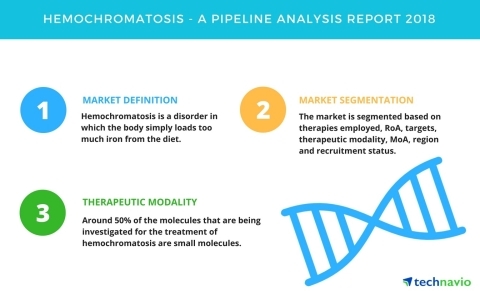 This drug pipeline analysis report segments the hemochromatosis market based on therapies employed (monotherapy), RoA (oral, subcutaneous, and parenteral), therapeutic modality (small molecule), targets (TMPRSS6, hepcidin, iron, and ferroportin), MoA (TMPRSS6 inhibitor, hepcidin stimulants, iron chelator, and ferroportin inhibitor), geographical segmentation (the US, Spain, Switzerland, and Belgium) and recruitment status (recruiting). It provides an in-depth analysis of the prominent factors influencing the market, including drivers, opportunities, trends, and industry-specific challenges. Technavio has published a new report on the drug development pipeline for hemochromatosis, including a detailed study of the pipeline molecules.